To follow up with the Jobs chart below is the following Major Players chart. Roll this if you need a quick idea of who is hiring the PCs. For added fun, roll the chart again to find out who the PCs are working against. For example, you rolled Surveillance in the Jobs Table. You then roll Local citizen as the one who is hiring the players. You then roll Empire as the target. Interesting. Perhaps a local citizen has been wronged by an Imperial Agent and wants the PCs to gather dirt on him/her. For instances where you don't want the big forces (the Hutts, Empire, Alliance, etc) to be involved, here is a modified chart, a Local players chart. It's a little more customizable to local politics. 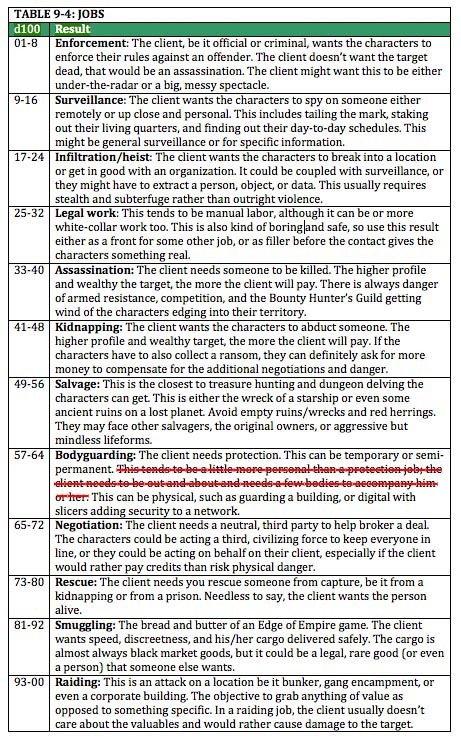 * by the way, I stole the idea for the Jobs table from Apocalypse World's Operator playbook. I stole the idea for the History table from Apocalypse World's Hx and Mythender's Bonds. I stole the idea for the Major players table from TechNoir. I've run various games with a "Hitting the Streets" or "Pounding the Pavement" genre aspect. This is the part of the story where the characters need to talk to their contacts, chat with various shady denizens of the streets, or pass some cash in order to get information. It's expected in some games like Shadowrun, Technoir, Dresden Files, and Edge of Empire. In movies and TV, this is where the detective talks to his ole buddy Vinny, or where the cops chat with that bartender in the know. 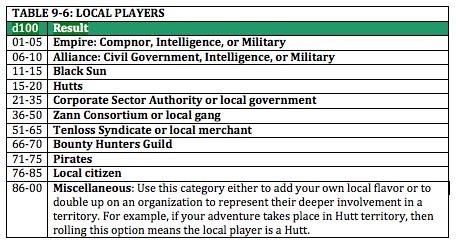 I have a hard time conveying this genre aspect in some rpgs. In Edge of Empire, the criminal's best weapon shouldn't be the blaster, but his/her knowledge and social network. And when the characters are wondering why their cred supply is so low, the first instinct should be to shake their social network for work. 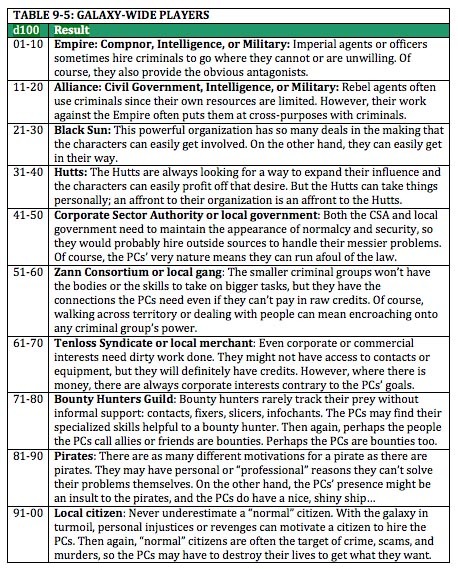 Shadowrun's character creation had you pick a couple of contacts, NPCs with certain skill sets you could call upon if you needed something. This was a great tool for world building; right from the beginning, you had 2*(number of characters) NPCs out there that the players could interact with. NPCs are vital to filling your world or universe. 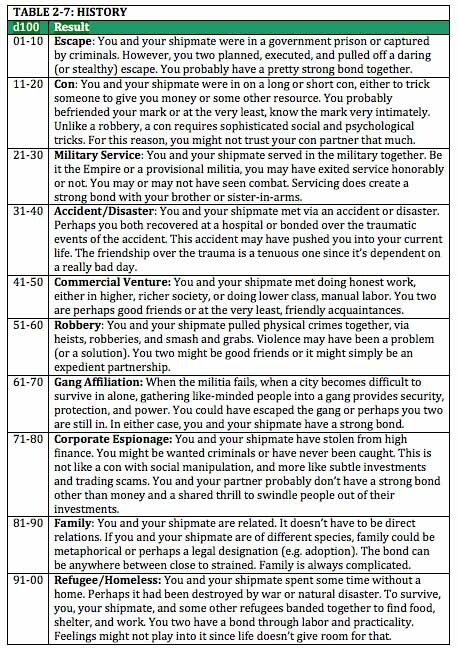 I think that an Edge of Empire character sheet could have a major section devoted to a Contact List. The first contact could be associated with their Obligation, either someone who helped them avoid it (like a owner of a safe house who houses people with the Criminal Obligation) or someone who represents a connection to that Obligation (like a cousin for a Family Obligation). The second contact could be associated with the character's Motivation. They share the Motivation or the contact can help the PC fulfill that Motivation. So right off the bat, the PCs have NPCs to interact that are also related to the character's personal history. Star Wars: Edge of Empire assumes that the characters are part of a team of thieves, smugglers, and bounty hunters. However, I noticed with my group that even with the Obligations and Motivations, the players don't have a good idea of their relationship with each other. Some games, such as Apocalypse World, Fate, and Mythender have specific prompts in character generation to codify the relationships between them. Other games, like Mouse Guard or Marvel Heroic have an implied relationship based on the setting. Other games, like D&D and Star Wars: Edge of Empire, assume a team mechanic but leaves it up to the players and GM to define it. I know some groups like to have the freedom to make those definitions, but I feel some form of prompt not only helps generate background, but it leapfrogs the conversation right away without waiting for a "natural" or "organic" time in the middle of a game to find out if one character even knows or trusts the other.